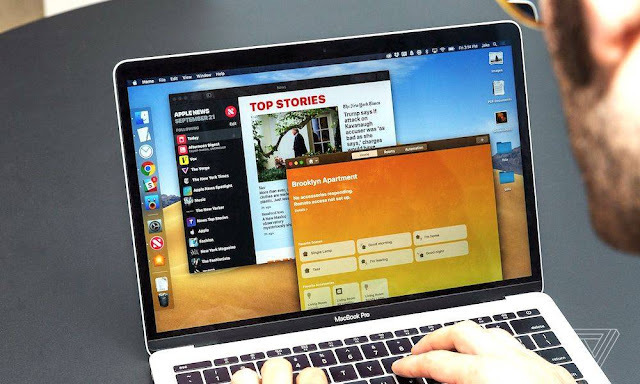 Apple on Monday officially released the next generation version of its Mac operating system: macOS Mojave. macOS Mojave, version 10.14, is a major update to the Mac platform. it introduces a range of features aimed at aesthetics, organization, productivity, security, and privacy . the update introduces a systemwide dark mode and dynamic desktops - which are essentially special wallpapers that shift and change throughout a 24- hour period mimic a day and night cycle. There is also a new Stacks feature that should help Mac users fight desktop clutter. Finder has also seen some additions, including a new Gallery View, a navigation Sidebar, an overhauled Quick Look, and a new Quick Actions feature. A new Continuity camera lets users easily import photos or scans from a connected iOS device, and Mac screenshots can now be edited on-the-fly with new native Markup tools. As part of its effort to bridge the gap between macOS and iOS apps, Apple has also ported several of its mobile applications to the Mac — including Apple News, Stocks, Home, and Voice Memos. On a similar note, the Mac App Store has also been completely revamped with a new design and an interface that makes app discovery much easier and simpler. Apple routinely updates its operating systems with new security and privacy protections, and macOS Mojave is no different. The company has added new Safari tools that make tracking your Mac tougher, as well as features that make creating and storing strong passwords even easier and more seamless. While Group FaceTime with support for up to 32 participants was originally planned for the initial macOS Mojave release, it was delayed. Apple said it will release it in a future update to Mojave. macOS Mojave should now be available to download from the Mac App Store for all compatible devices. (Alternatively, here’s a direct link to the download). A full list of Mojave-compatible Macs can be seen below.